What was my first Motorpsycho album? I remember listening to 'Let Them Eat Cake' and not liking it enough to spend money on the album. My first cd became 'Phanerothyme'. An album from 2001. By then the band had been releasing albums for 10 years and in the mean time we have progressed another 16 years. Again a double album is released by the band on which it goes all out in songs of over 10 minutes and manages to keep things concise that is under of around 7 minutes and twice managing under four. Through the years I've always liked the concise Motorpsycho better. So how do I fare with The Tower? The first thing I notice when going through the album for the first time is the enormous energy the Norwegian have put into the album and managed to share with its listeners to. The enthusiasm of the band is bordering on overload. The Tower bursts with ideas, time changes, solos and double tracked vocals. It is impossible to not pay attention to what Motorpsycho is doing here. When I read the the title of the album, I was reminded of something else, of 'In Your Life' of the band called The Tower, the vehicle of Boudewijn de Groot when he decided to switch to English. The single is obscure yet fantastic and in my life for nearly half a century. Is there a similarity? If there is it's in the psychedelic undertones in both. Motorpsycho is rocking out at its loudest here. In all the opening songs there is no hanging back for a second. New drummer Thomas Järmyr must have found out very soon why he was asked to join the band. There's no rest for him. The gas comes off in 'Intrepid Explorer'. A slow psychedelic outing starts the song until Bent Saether's bass takes over and starts tolling out a rhythm that is slowly picked up by Järmyr and allowing Hans Magnus Ryan to start filling in things with his guitar. There's some synths involved. Slowly 'Intrepid Explorer' is building up and keeps expanding until it bursts at the seams. One long drawn out note and one chord over which lead notes are played, while drums and bass are rocking out ever louder, faster and more impressive. We're on a road to the unknown, but by then nobody cares. Either the groove has gotten you in a trance or you left this expedition screaming. The song ends with a return to the 60s psychedelia. Everything in between was unthinkable at the time.Even with all these substances around. 'Intrepid Explorer' is 50 years of musical and studio/recording development for you. CSNY? Why not. Like on 'Phanerothyme' a nod to past heroes can be found here. 'Stardust' is as small as Motorpsycho can become. Some beautiful harmonising like on the first two albums of CSN(&Y) shows how well these guys can sing together. An acoustic guitar and a mellotron like sound fill in the rest. No drums in sight. Just plain beautiful and a great counterpoint to what came before and explodes right after. 'In Every Dream Home (There's A Dreamer)'. A fiery riff propulses the song forward. It's like The KLF sang in that weird hit "Going going forward 'cause we can't find reverse". If anyone is loaded here it's Frank Zappa. Hear the bass riff and the slightly off course guitar solo. The difference is in the melody. Motorpsycho lets in the rock element much more. And Zappa hated hippies, with Motorpsycho that is definitely different. The hippie element is always somewhere around waiting to be let in to a song. I've listened to the 6th song now. The two longest songs still have to come by then. Together they last half an hour. (With 11 minutes for two more songs.) I arrive at 'The Maypole', one of the two three minutes something songs. Again a quieter, more delicate affair. Acoustic at heart with a pop melody. Something like 'I'd Like To Teach The World To Sing'. Yes, I'm exaggerating a little here, of course, but not a lot. It shows the versatility of this band. The longest track on the album 'A Pacific Sonata' starts just as quietly as 'Stardust'. To my surprise I'm listening again to a tranquil song with some great harmonising. Like a Pacific holiday the composition is full of sand beaches, coconut trees and warm sea water. David Crosby used to own a schooner. It seems to me I know who owns it in 2017. I can't blame Ryan and Saether to swap the dismal Norwegian west coast for warmer climes every once in a while. After 8.30 minutes the song changes, but the point was made by then. It all ends with 'Ship Of Fools', another nearly 15 minute song. The Tower goes out with one big bang: "Never surrender". No way, when a song has an impact like 'Ship Of Fools'. The icing on the cake, the weather vane on top of the tower. What is a strange experience, also somewhat sobering is the following. After writing the core of this review, I put on the new record of the French band Garciaphone, 'Dreameater', released on the small Dutch label Tiny Room Records. The music is described as slowcore. It has an uncanny likeness to the music on The Tower if; I strip all the bombast from it in my mind. Strange but very true (read on here, if you like to learn more: http://wonomagazine.blogspot.nl/2017/11/dreameater-garciaphone.html). 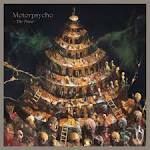 "There's a singer for every song" Motorpsycho sings in 'A.F.S.E.'. That may be, but I'd say it is all quite unique what is going on on The Tower. Overkill may be before the corner. What an overkill it is. When I'm in the right mood for The Tower, the album is simply stunning. There's so much to discover, so many layers on this record that it will keep me busy for a while. 'Here Be Monsters' was a comeback in my eyes, as I had stopped listening to new records since circa 2010. 2017 is the best year yet it may well prove to be for Motorpsycho and Norwegian progrock in general, with Soup's latest album 'Remedies' lauded on this blog recently. It's time for me to turn The Tower on again.